The popularity of the cajon has given rise to numerous accessories for the percussionist from pedals and cymbals to a device called a “heck stick”. Schlagwerk is the manufacturer of the ‘heck stick’ and ‘side kick’ which adds the functionality of a hi-hat type of cymbal sound as well as a foot operated castanet that can be kicked and mounts on the side of the cajon – or may be detached and stepped on while on the floor beside or in front of the cajon. 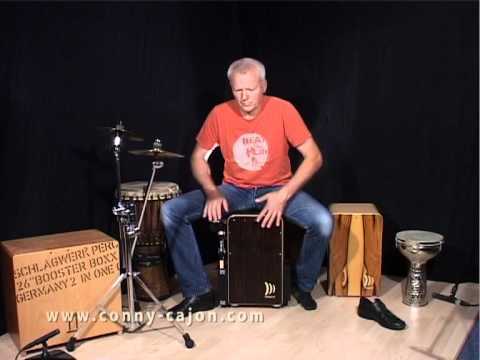 The beauty of a cajon is its portability, and these two solutions do not detract from this key feature unlike complicated pedals and hi-hat cymbal sets that suddenly begin turning the ‘percussion in a box’ solution the cajon provides into making the cajon a replacement for a bass drum. A cajon should be able to be packed into a single carrying bag and carried over one’s shoulder… we give the Schlagwerk ‘Heck Stick’ a thumbs-up! Error: the store '' cannot be found. Either it does not exist or Zazzle was inaccessible.